187 pages | 32 Color Illus. | 53 B/W Illus. 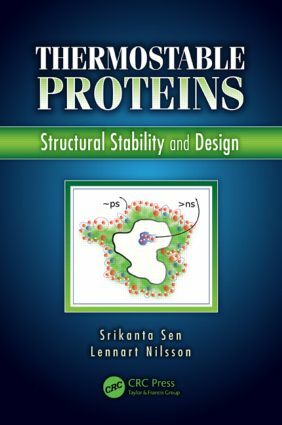 Thermostable Proteins: Structural Stability and Design provides a comprehensive, updated account of the physical basis of enhanced stability of thermophilic proteins and the design of tailor-made thermostable proteins, paving the way for their possible industrial applications. This book is devoted to understanding the survival mechanisms of "thermophilic life forms" at the molecular level with an emphasis on design strategies. Understanding the molecular basis of how thermostable and hyperthermostable proteins gain and maintain their stability and biological function at high temperatures remains an important scientific challenge. A more detailed knowledge of protein stability not only deepens our understanding of protein structure but also helps in obtaining insights into processes that drive protein activities—folding, unfolding, and misfolding—essential to biological function. Julie C. Mitchell, Thomas J. Rutkoski, Ryan M. Bannen, George N. Phillips, Jr.
Dr. Srikanta Sen is currently working as a Senior Fellow at Chembiotek, a TCG Life Sciences group of companies in India. He has developed the Molecular Modeling and Computational Biology group of Chembiotek and has been leading the group for the last ten years. He received his M.Sc. degree in physics from Calcutta University, India. He pursued his Ph.D. work at the Theory Division of Saha Institute of Nuclear Physics, Calcutta and received his Ph.D. degree in Physics in 1991 from Calcutta University. He did his post-doctoral research between 1992 – 1998 at Umea University, Stockholm University and Karolinska Institute in Sweden. He then worked in Indian Institute of Chemical Biology in Calcutta, India for two years. He moved over to Chembiotek in 2001. His research interests include protein-nucleic acid interactions, especially transcription factors and the ribosome, and questions concerning information transfer in biomolecular complexes. He is one of the core developers of the CHARMM molecular simulation program.